I have just read my first post of the year. I’m no longer that person anymore. I cannot believe that in the space of nine months that I have changed as much as I have. I have learnt so much about who I am in such a short space of time. I can honestly say that I now accept who I am, all that I am and who I will be. Acceptance of myself has given me the freedom to be who I am and just for me. Today was one of those typical Melbourne days. This morning I left my house and it was cold, arrived to where I was heading and it was muggie, by mid-morning it was stormy, by the afternoon it was steamy and by the time I got home again it was windy and cold. Typical! Typical is all I can say. The point of me telling you about the weather is that with this ever-changing day I started wearing my jeans as one would normally and decided to roll them up because they had gotten wet and were uncomfortable. I couldn’t be bothered to unroll them back to how they were ‘meant’ to look so I didn’t and on my way home it struck me that I didn’t care. I didn’t care because I actually felt comfortable not just in my rolled up jeans but in my own skin. Through job-searching and many rejections I’ve realised that none of it actually matters. We all get there eventually. I want what I want in my life and because I know who I am, my determination and persistence – I know that I will get there. My Mum told me today that she was proud of me. That’s all a daughter wants, is to make their parents proud and as I see my mother as a person that took on both parental roles; I feel like I’ve done my job. While even though these words are making me cry. It’s not because I’m sad, it’s because I’m happy. Today was such a great day! I got to spend it with someone who I care about, I very much enjoy her company and felt very much appreciated for me and what I do for people. I arrive home and find a parcel for me. First thought is: uh-oh… I don’t remember ordering something from *insert name of company here* what have I done? I open the parcel. It’s from Pigeon Hole, NT – a 2013 calender of photos of the kids I taught – how wonderful! I end the day with a catch up with Mum and the viewing of “Brave”… I’m exhausted. But I feel great!! Things will work out in the end. 🙂 The best thing is realising that I know I can do it. I sit here today as a woman about to experience my next chapter. As I knew but didn’t quite believe back in 2007. Life is beautiful. Signing off to grab a glass of water and get ready for bed! I remember as a child being excited about going to see the Christmas lights. I never would have have thought I would grow up to find a street being lined with Christmas wool. 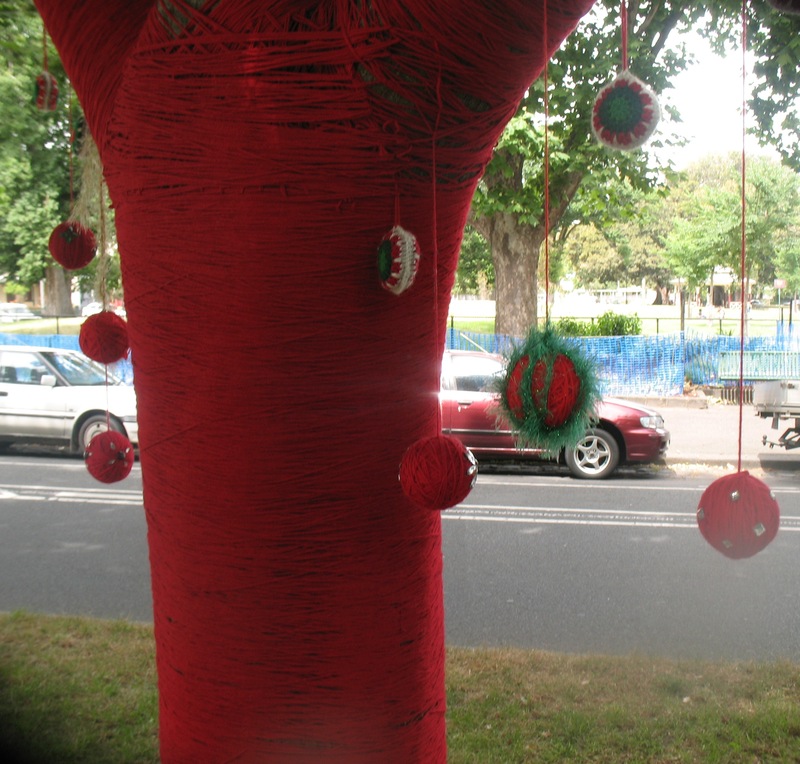 The crowds have been flocking to a nature strip to take photos of trees covered in wool. It’s a strange concept but I believe it works. I think in this day in age with people being swayed into looking after the environment wool could be a way forward… Maybe? I’m not actually sure if this could actually take off. But so far I think for this leafy street, it’s doing the right job. In a snow-covered street it may not have quite the same effect. But that’s what I like about being a warm climate for christmas. We’re different to most everyone else. We still eat big meals, exchange gifts and spend time with family. But we get to do it in the heat, under the sun and at the beach if we so desire. An Aussie Christmas is not what you hear about in traditional carols or stories and most people from other parts of the world don’t quite understand it but I think that’s why I love it. I’ve experienced a Christmas in winter and I have to say it wasn’t quite the same. It was more like being in a story-book or fairytale land which on one hand was great and to have to experience just once was pretty cool. But I much prefer Australia. I’m usually hanging at the beach just chilling and I love that! I can’t believe it’s nearly that time of the year again! I’ve had such a whirl-wind of a year but I’m really grateful to soon be starting the new adventures that I’m sure 2013 will bring! To Christmas wool – will it be the new ‘thing’ for Christmas? It sure is attracting attention! Signing off – happy end of the year! If you have a choice to be on a gluten free diet and you’re considering it because you think it’s healthier… think again. I have Coeliac Disease which has meant that my doctor “prescribed” a life-long gluten-free diet. I don’t have a choice. I have to stay away from foods containing wheat, rye, barely and oats. I’m not doing this because I’m a picky eater, because I want to lose weight or because it’s a trendy thing to do. I’m doing this because I want to look after my body. I want to be able to someday have babies, do as much as I can to prevent myself from getting cancer and try and not get any other disease or illness. If I eat gluten it’s not as though it’s an intolerance, I get sick, recover and then continue my life as it was. I’m actually damaging my body. In people with coeliac disease the immune system reacts abnormally to gluten (a protein found in wheat, rye, barley and oats), causing small bowel damage. The tiny, finger-like projections which line the bowel (villi) become inflamed and flattened. This is referred to as villous atrophy. The surface area of the bowel available for nutrient absorption is markedly reduced which can lead to various gastrointestinal and malabsorptive symptoms. A number of serious health consequences can result if the condition is not diagnosed and treated properly. See people! Do you understand now? Why does the super-market put the gluten-free options in the health-food section? That to me is sending completely the wrong message. Isn’t it? I believe that just doesn’t make any sense. But then again a lot of these things before becoming more mainstream were in health food stores. I just sometimes wish I wasn’t walking through the super-market so confused and like I said a thousand times before that more people have a better understanding of people who have these type of conditions. Or at least if they didn’t stop pretending that they knew what they were talking about. Don’t make the same mistakes I have, Asian food just because most of their dishes are served with rice is most certainly not gluten free. Oh and by the way – don’t ask me if I have vegemite because I can’t eat it! On a lighter note – a friend and I are going to a 100% Gluten Free Cafe tomorrow for lunch. I’m excited because I get to order anything off the menu! Enjoy it and stop worrying about your next step! I feel like I’ve gotten to the part of my life that’s like being in transit at the airport. I’m waiting for the plane to be ready to fly me to my next destination. I completed my university degree about two weeks ago now and believe to have experienced a downward spiral of emotions from my initial release and relief of finishing. My Mum has reminded me that where I am in my life at the moment is ok. Completing my degree is a huge achievement and what I have found hard is to sit with this thought. To be in the moment. I’ve been on a whirlwind of job searching and working in my current job/s as a nanny/babysitter and even though I have had more time than when I was a student it’s almost like I feel like I haven’t had the time to do anything else. I haven’t even had a couple of drinks with friends! How crazy is that? Stress has taken over and what or who for? Within the last few days I have decided that for now on I just have to live my life how it is, be in the moment and see where it takes me. Mum is right, it’s ok. It’s totally ok.
All I can say after hearing that is that I feel much better about it all. It’s not to say that I’ll put a stop to all that I’ve been doing. It’s just to say that I’m going to do my best to enjoy finishing something that has taken four years of my life to complete. I put so much pressure on myself sometimes and I think that it’s taken me the last four years to realise this about myself. I’ve had a tough four years. I’m not just talking about my studies either. In my personal life I have experienced a lot of hard things that we as human beings endure. I even got to the point last year where I was stressed so much that I became sick a lot of the time, facing a diagnosis of Coeliac Disease, having my appendix removed and dealing with other bowel and adominal problems. Three years into my degree and I was ready to give up. Now here I am and I’ve done it. I’ve put in all the hard work. I’ve achieved great results even in the face of hard times and I’ve conquered my degree. I’m a university graduate. That’s the first time I’ve managed to write that, to say it do myself and it feels great! I’m finally congratulating myself and seeing what I’ve done and how amazing it is. Plus I’ve just organised to celebrate with a uni friend of my mine – finally!